The ore from the Zone 5 Starter Project will be treated in the Boseto concentrator, seen here (photo: Arthur Tassell). Khoemacau Copper Mines (Khoemacau) and Cupric Canyon Capital have announced major progress towards the construction of the Khoemacau copper/silver project in Botswana with the signing of a ‘Project Funding Package’ to commence development of the project. Khoemacau is owned by Cupric Canyon Capital. The highlights include US$565 million of funding including a US$275 million senior debt facility from Red Kite Mine Finance (RKMF), a US$265 million silver stream from Royal Gold AG (RG AG), a wholly owned subsidiary of Royal Gold, Inc, and a US$25 million subordinated debt facility from RG AG. The funding will be used for construction of the Khoemacau Starter Project processing ore from a 91 Mt resource at a head grade of 2,02 % copper and 21,4 g/t silver. The direct construction cost of the Starter Project is US$397 million over a two-year construction timeline. Khoemacau and Cupric (together referred to here as the ‘company’) have been developing the Khoemacau project, a 4 040 km2 land package in north-west Botswana, over the past six years. One of the deposits within the project, Zone 5, was initially discovered in 2012 and has since become the flagship deposit since it was acquired in 2013. Since then, the company has drilled 285 000 m, completed permitting and land access agreements, secured the required power and water, and undertaken advanced engineering, procurement and mobilisation such that it is ready for full construction release of the Starter Project, pending closing of the project funding package. In 2015, Khoemacau and Cupric acquired the Boseto assets (a previously operated copper project adjacent to Zone 5) following the insolvency of that company’s parent. This acquisition offered access to the 3,0 Mt/a Boseto processing facility, located 35 km from Zone 5, along with extensive infrastructure, and various mineral resources and licences. Since acquisition, the Boseto assets have been incorporated into the Starter Project development plan. The Starter Project will see the fully mechanised underground mining of sulphide ores at Zone 5 at a rate of 3,6 Mt/a using the upgraded Boseto processing facility for crushing, milling, flotation and production of a high-grade copper/silver concentrate. Three separate but adjacent underground mines will be developed at Zone 5, each producing 1,2 Mt/a on average for the first five years. Each of the mines will have its own independent ramp access and operate over a strike length of approximately 1 000 m, extracting ore using a conventional sub-level open stoping mining method. The mined ore will be trucked to the Boseto processing facility, which will be refurbished and enhanced to process 3,6 Mt/a. Processing will be conventional sulphide flotation via three-stage crushing, ball milling and flotation, which will produce a concentrate for shipment to African and international smelters. Power will be sourced from the Botswana Power Corporation grid via a 56 km overhead transmission line connection. Existing diesel generation capacity remaining from the previous Boseto operations will be used as backup power. Water will be supplied from three borefields along with dewatering boreholes from the mines at Zone 5. The Starter Project is expected to produce a high quality copper concentrate with an average grade of approximately 40 % copper and high-grade silver. This results in average production of 62 000 tonnes of copper and 1,9 Moz of silver per annum over a 21-year mine life. The average life-of-mine C1 cash cost, net of silver by-product credits, is US$1,47/lb at consensus pricing and US$1,67/lb including sustaining capex, and before accounting for the silver stream. With financial close expected early in the second quarter of 2019 and a two-year construction timeline, the Starter Project is forecast to produce first concentrate beginning in the first half of 2021. 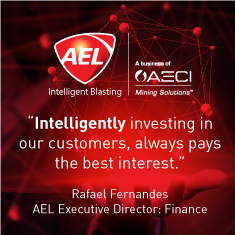 Johan Ferreira, CEO of the company, commented: “Securing the Project Funding package by partnering with two of the industry’s leading global providers of mine finance, Royal Gold and Red Kite, allows us to move forward energetically with all project development activities. This step marks the completion of a remarkable evolution of the company from discovery of Zone 5 in 2012 to full construction of a high-quality copper asset in 2019. The company’s short-term plan is to achieve safe, reliable production from the Starter Project. The long-term plan is to expand Khoemacau to approximately 5,8 Mt/a by constructing a new standalone process plant at Zone 5. A pre-feasibility study was completed on the Expansion Project in 2015, and the company intends advancing this to a definitive feasibility study and then full engineering for this in conjunction with the construction of the Starter Project. The Expansion Project is expected to produce approximately 100 000 tonnes of copper per annum.